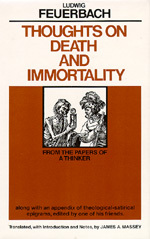 Never translated before, 'Thoughts on Death and Immortality' was the first published work of Ludwig Feuerbach (1804-1872). The scandal created by portrayal of Christianity as an egoistic and inhumane religion cost the young Hegelian his job and, to some extent, his career. Joining philosophical argument to epigram, lyric, and satire, the work has three central arguments: first, a straightforward denial of the Christian belief in personal immortality; second, a plea for recognition of the inexhaustible quality of the only life we have; and third, a derisive assault on the posturings and hypocrisies of the professional theologians of nineteenth-century Germany.